A little while ago the people at The Works gave me a voucher to spend in their store! Yippee! Among the crafty bits and bobs I chose was a set of fabric paints. 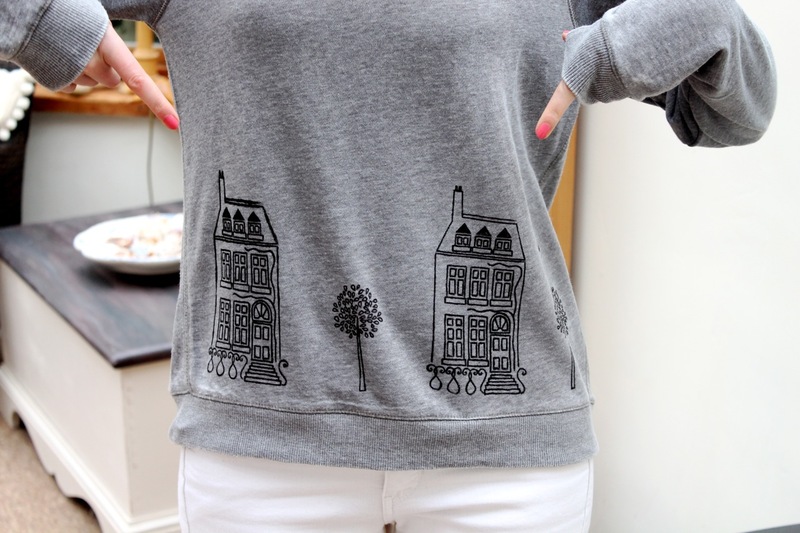 This gave me the perfect excuse to put my crafty hat on and try my hand a DIYing my own jumper. First up, pick out a cute design. Mine came out of 'The Bumper Book of Embroidery Transfers'. This is authentically vintage as it was my mums and it's got to date back to the early nineties at least! 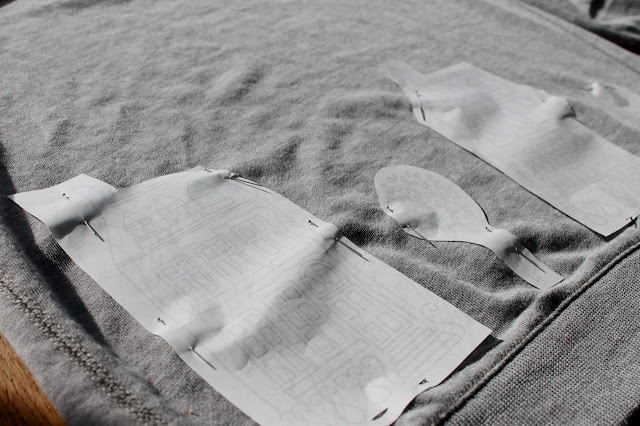 Pin your designs upside down to your jumper. Try to avoid using the pretty pins with little coloured plastic bobbles on the top. I used these once and the iron will melt them very quickly onto your lovely jumper, and that probably isn't the kind of unique design you were going for. 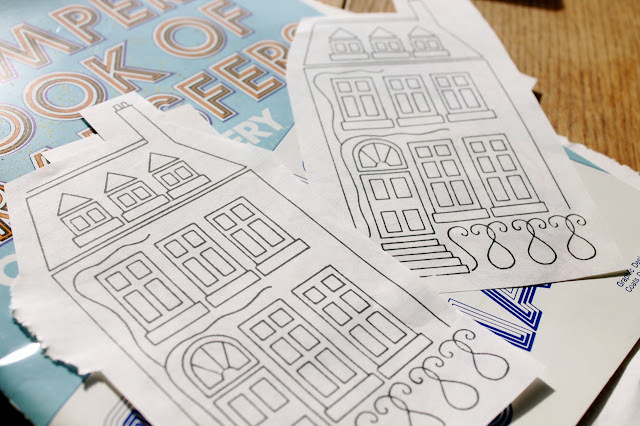 So, once you have them pinned securely in place you want to carefully iron over each design. You can peel back the corner of the transfers to see how well they have taken, if they are missing areas or are not dark enough then just iron a little more! Once you are happy that the whole design has been transferred you can unpin them. Now get your fabric paints and start painting! You can see above how the transfer came out (the lighter areas of the design) and the areas I have started to paint. In the end I decided to just use the black paint, but i might add some pretty colours at a later date. I found that the nib of the paint a little too large for the intricate designs of my pattern, so i resorted to using my nail tools to do the job, but they actually worked quite well! Although it made it a little more time consuming than i would have liked. I think it turned out pretty good, what do you think? I'm not sure how the paint will wash yet, but it looks like it will hold up well. 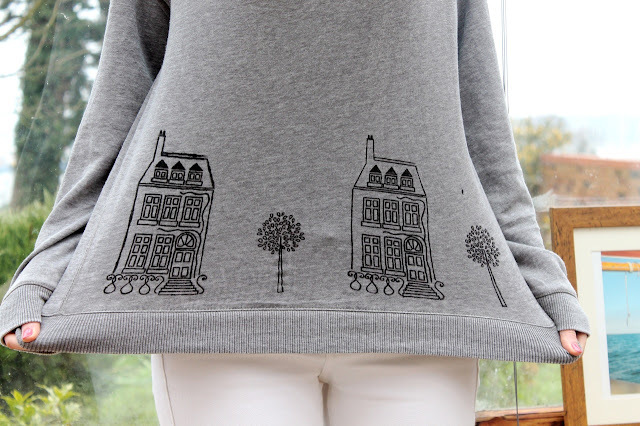 If my new lucky house jumper helps me to find a house like that one then I shall be very happy! Well, I can dream! Wish us luck! P.S As I am posting this Chris is putting in an offer on a house we went to see this morning, eep! This is so adorable, and such a cute outfit!! I'm always looking for new ways to print on shirts and this looks like an absolute winner! Best of luck with the house hunt! The jumper looks great. I love your DIYs :-) always so inspiring! Fingers crossed for the house! What a great idea! It looks super good. That is super cute! Love this idea! How lovely :) What a gorgeous picture you chose, too. 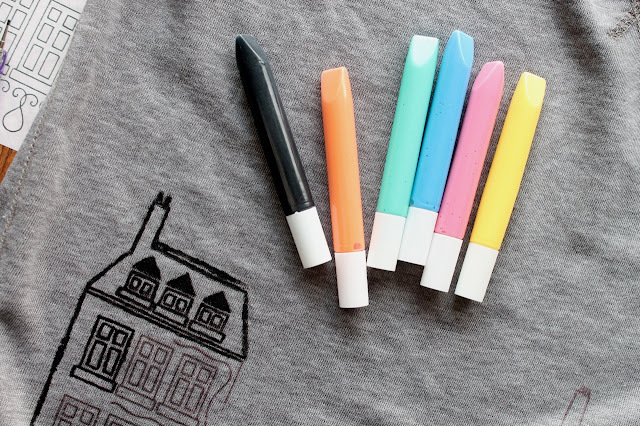 I'm a big fan of fabric pens- similar to the paint but basically giant felt-tips. 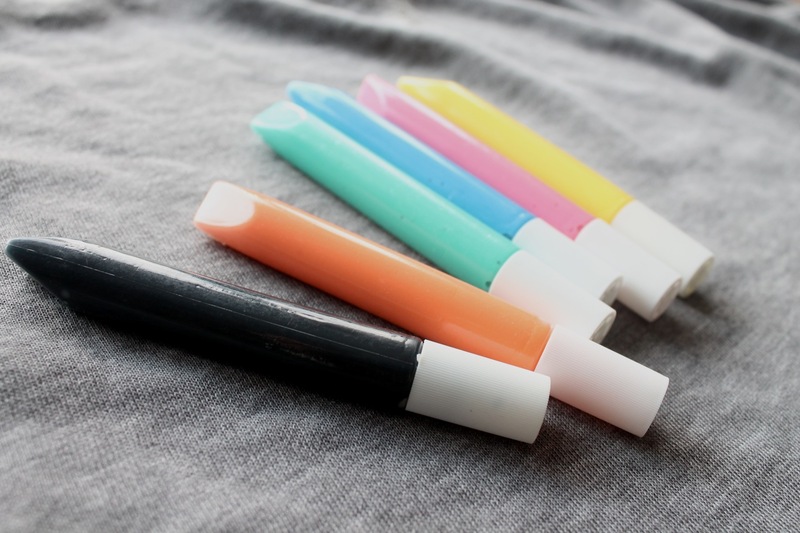 I mostly use them to draw dinosaurs on things (obviously!). Oh wow! It looks lovely! Such a good idea. This is really cute. The house design makes it really personal to you which I like.